Welcome to the Artistic Outpost Design Team February Blog Hop! Each month, the fabulous designers at Artistic Outpost showcase projects created with various Artistic Outpost stamp sets. This month, the Designers are sharing projects they created using a Book theme. Some of the designers are using Artistic Outpost stamps that have a book theme, others are showcasing AO stamps with book folds or stamps used in books, such as journals. We hope you'll take the time to hop along with us! 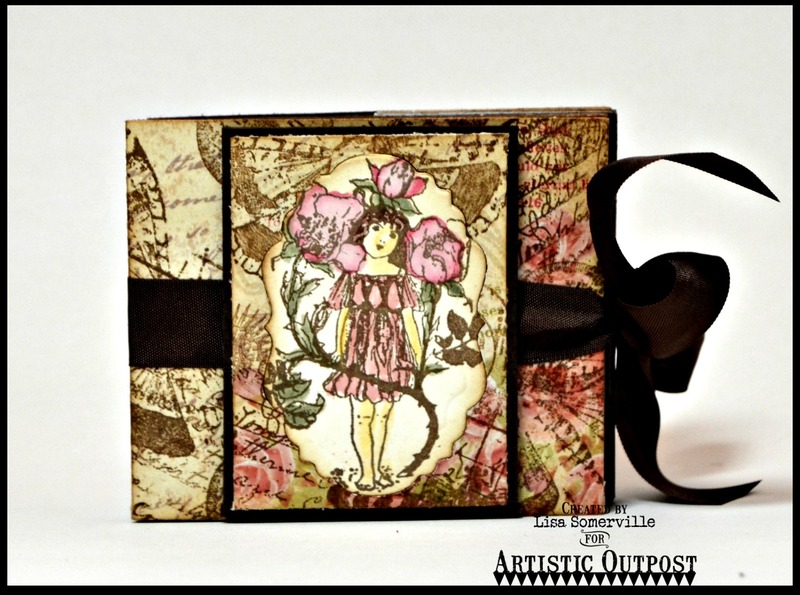 I created a Concertina Book using Artistic Outpost stamps from the Neverland, Whimsical Melange, Ephemera Backgrounds and Flower Market stamp sets, along with papers and dies from Our Daily Bread Designs. Using the Whimsical Melange (circle collage), Ephemera Backgrounds (journal page) and Flower Market (moth and dragonfly) stamp sets, I stamped the images in Coffee Archival Ink on the Blushing Rose Paper Collection, then scored the panels and die cut the centers using one of the dies from the Vintage Labels die set. For the front pattern paper on the front cover was stamped the same was as the inside. Tinkerbell from the Neverland stamp set is stamped in Coffee Archival on Vanilla card stock, die cut using the Vintage Labels Die and colored with STAEDTLER Karat Aquarell Watercolor Markers. Lisa, that is so pretty! Love the colors and the stamps that you used to create this book. A gorgeous make Lisa. Love the design and stamps you used. Lisa, I am so loving your concertina book! The images are adorable and your coloring amazing! This is a beautiful book! I never heard of a concertina book. So much going on in the background with the pretty patterned paper and the cute little girl. Love it!